Pro Se Productions, a leading publisher of Genre Fiction, proudly announces the debut of its latest novel featuring perhaps the most popular detective ever created, Sherlock Holmes. Author Stephanie Osborn, creator of The Displaced Detective series, which also features Holmes, brings her exceptional skill and Sherlockian knowledge and love for the character to a new series for Pro Se. Sherlock Holmes and The Mummy’s Curse, Book One of Sherlock Holmes: Gentleman Aegis is now available in print and digital formats. Sherlock Holmes and the Mummy’s Curse is the debut volume in a new imprint from Pro Se Productions- Holmes Apocrypha. Holmes Apocrypha will feature works that take Holmes onto adventures and in directions that go beyond Sir Arthur Conan Doyle’s original canon, including supernatural stories, science fiction interpretations, and more. Holmes and Watson. Two names forever linked by mystery and danger from the beginning. Within the first year of their friendship and while both are young men, Holmes and Watson are still finding their way in the world, with all the troubles that such young men usually have: Financial straits, troubles of the female persuasion, hazings, misunderstandings between friends, and more. Watson’s Afghan wounds are still tender, his health not yet fully recovered, and there can be no consideration of his beginning a new practice as yet. Holmes, in his turn, is still struggling to found the new profession of consulting detective. Not yet truly established in London, let alone with the reputations they will one day possess, they are between cases and at loose ends when Holmes' old professor of archaeology contacts him. 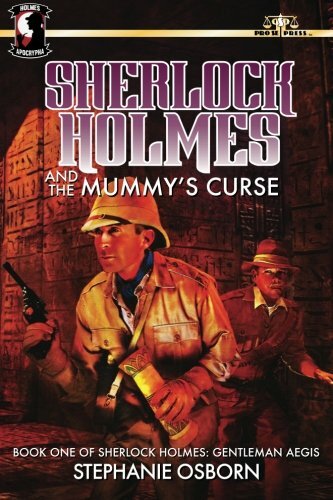 Featuring a fantastic cover and logo design by Jeffrey Hayes and print formatting and logo design by Percival Constantine, Sherlock Holmes and the Mummy’s Curse is available now at Amazon at http://www.amazon.com/Sherlock-Holmes-Mummys-Curse-Gentleman/dp/1518883125/ref=sr_1_3_twi_pap_1?ie=UTF8&qid=1446569718&sr=8-3&keywords=sherlock+holmes+and+the+mummy%27s+curse and Pro Se’s own store at www.prose-press.com for 15.00. The first volume in Osborn’s Sherlock Holmes: Gentleman Aegis series is also available as an Ebook, designed and formatted by Forrest Bryant and available for only $2.99 for the Kindle at http://www.amazon.com/Sherlock-Holmes-Mummys-Stephanie-Osborn-ebook/dp/B017IX33NW/ref=sr_1_2?ie=UTF8&qid=1446569797&sr=8-2&keywords=sherlock+holmes+and+the+mummy%27s+curse and for most digital formats via Smashwords at https://www.smashwords.com/books/view/590130.